MARGRAF invite to the press conference – that will take place on June 29 at 9:00 a.m. at The May Fair Hotel, London – to discover its exclusive Italian marble and the new World Financial Center project – New York, with the participation of Arch. Craig Coperland – Pelli Clarke Pelli Architects. Margraf’s story (former Industria Marmi Vicentini) started in Chiampo (province of Vicenza) in 1906. Since its early start, the company devoted to accurate research work and development of new technologies, working in tight collaboration with famous international architects. Today, after more than a century, Margraf is a leading, world stakeholder in this field. Among many other pluses, Margraf owes its worldwide established reputation to its skilful extraction of marble and the ability to transform it into finished, polished slabs or tiny tiles and to provide a huge array of precious materials and excellent products for building construction and architecture (from the cladding of inner and external walls, to interior design items, to bathroom and kitchen decoration). On top of all this, Margraf ensures extensive environmental compliance investing any efforts to minimize any possible kind of environmental impact. This includes the use of cutting-edge technologies, the implementation of landscape recovery and energy saving practices, as well as the exploitation of renewable resources. Margraf is a perfect merging of past and present forming a first-class enterprise eagerly turned to the future. 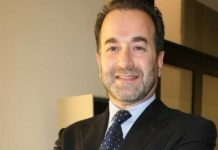 Margraf is again running high on the international market: the company headquartered in Chiampo, Vicenza, is going to supply 10,000 sq. m of exquisite marble in customized sizes and formats, out of its quarries of Botticino Classico and Fior di Pesco Carnico destined to the refurbishment of the new World Financial Center in New York. Pelli Clarke Pelli Architects, the designers who first did the original project back in 1988, took care of the first extensive and large renovation of the existing building. The works consist in the requalification and rearrangement of the interiors and of the entrance halls with the aim of maintaining the essential parts of the present structure. Recently, a new magnificent lobby was added to the Tower Four South Hall facility in Brookfield Place. The new entrance is wider than in the original plans of the ’80s, and designed as an open space with natural room illumination using sunlight. The overall surface is 24 m wide, 21 m long, and nearly 6 m high. The South Lobby looks out towards the east, on Brookfield Place, and south, with a beautiful view of Battery Park City North Cove Marina. MARGRAF S.p.A– Via Marmi, 3 – 36072 – Chiampo (VI) – Italy – tel. +39 0444 475900 – info@margraf.it – www.margraf.it Margraf Botticino Classico and Fior di Pesco Carnico have been respectively used to clad a wall in the core space, the side walls, and the entire interior floor. Fior di Pesco Carnico and Botticino Classico slabs have been laid on every surface according to an apparently random pattern, merging hues without any recurrent vein. This was meant to enhance the natural tones and streaks of the different materials and to ensure greater, overall brightness. Therefore, the refurbishment and finish of the South Lobby translates into a new, wider access to the Tower, embellished by new natural materials “made in Italy”. In order to ensure consistency with the remaining older parts of the facility, Pelli Clarke Pelli Architects decided to use the same Fior di Pesco Carnico as for the first part of the project in the ’80s. This exquisite marble in changing hues from grey to rose, and white, with ivory streaks, and a coarse, grained texture is exclusive to Margraf and comes from the only existing quarry of Forni Avoltri (Udine). When asked, Architect Cesar Pelli explained that Fior di Pesco Carnico teams perfectly with any other marble type: “… We actually use it quite often in combination with marbles in other colour shades. I wanted a marble type that could be used in concert with green, red, and orange hues and Fior di Pesco Carnico performs very pleasingly because it contains a bit of all colours. Nevertheless, you can also use it by itself to get very attractive and vivid flooring effects …” The architect’s love for this natural material means that he has been promoting its application all over the world, from the Winter Garden of the original World Financial Center in New York, up to the Canary Wharf Main Tower in London. For over a century, Margraf has been siding with international architects in their master works in Italy and abroad, thus becoming an icon of the excellence of the “made in Italy” all over the world. Industria Marmi Vicentina experienced its first success in the USA back in 1906 when the first skyscrapers were built. Since then, many important projects have been executed, including for instance the Coca Cola Building in Atlanta, the IBM Tower in Georgia, and the Smith Centre for the Performing Arts in Las Vegas. Nowadays, Margraf’s marble and natural stones are an increasingly frequent “specification” for the construction of many hotels, luxury residential homes and community spaces. 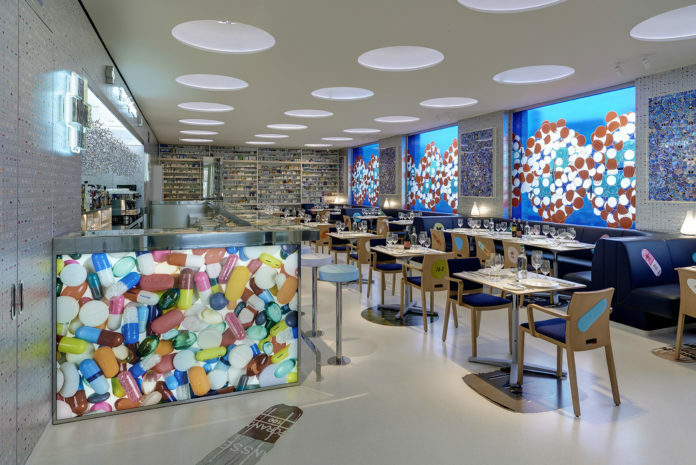 Margraf and Damien Hirst in London: The Pharmacy 2 is born Located within Newport Street Gallery in Vauxhall, Pharmacy 2 is Damien Hirst’s restaurant, launched in collaboration with Mark Hix. The restaurant opened on February 23rd, serves traditional British, European and Mediterranean specialities to the Gallery’s visitors during the day, and in the evening after the gallery is closed. Thanks to a long tradition in the processing of marble and to the use of cutting-edge technologies, Margraf was chosen by the Caruso St John Architects firm to create an extremely original floor: a white surface of marble resin, inlaid with 21 large pills, carved using new generation waterjet machinery, finished by hand, and made with 35 types of brightly coloured fine marbles (green, red, yellow, blue, pink, blue, etc.). It is a spectacular match of workmanship and technology. The company based in Chiampo, near Vicenza, has been for years a leading player in London through its collaboration with the city’s most prestigious architectural firms: from the Main Tower in the Canary Wharf finance complex, through the prestigious Fenwick Bond Street luxury mall, to the Burlington Arcade, the historical shopping gallery that hosts luxury shops, reopened in 2015, after a long and complex renovation effort. Previous articleBrexit – What can companies do to mitigate the impact?